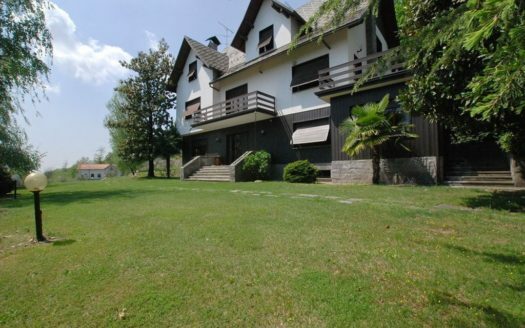 Exclusive and large Property for sale on the first hill of Arona consisting of a Villa, doorkeeper, farming storage with stable and animal shelter, in a scenic and sunny area. Its position above the lake, allows to appreciate the cool and ventilated area during the summer. The glimpse of the lake and the surrounding valley of woods make this place fascinating and relaxing. This property is ideal for those who appreciate life in the nature. The park of 5 hectares, it is divided into the entrance area with a characteristic and important avenue of lime trees, the part planted with azaleas that offer a unique show during the blooming season, the lawn, the upper terraces with part of the chestnut wood area and a part of an olive grove with more than 100 plants. The surface of the Villa measures 1.600sq.m on 3 floors above ground, plus the basement. It is composed on the mezzanine floor by a large entrance hall with an imposing wooden staircase that connects the night area to the first floor, a large living room with fireplace, another living room with fireplace and adjoining dining room, kitchen, a bathroom and laundry. On the first floor there are a lounge and billiard room, four bedrooms, three bathrooms. On the second floor there are four bedrooms, two bathrooms and two closets. In the basement we find a tavern, a kitchen, two storage rooms and a double garage. The housekeeper house is spread over two floors for 200sq.m total. The particular farming shed can be expanded and transformed into a house, there are three buildings to raise small animals. The whole Property is in perfect state of maintenance. It is located in the village of Montrigiasco, 5 km from the town center of Arona and the lakeside, in the immediate vicinity, within walking distance is a characteristic restaurant, much appreciated for local cuisine.